As clan leader you are responsible for the well-being of your clan during the Stone Age. You need to develop new hunting technologies and get new knowledge, to successfully hunt food or to learn to control fire. With help of these skills you will harvest enough food to feed your clan and to spread it far enough to reach new hunting areas. In this game you are always confronted with manifold decisions: which technology cards offer you the biggest advantages, when it is the right time to spread your clan on the game board, which hunting areas will grant the most food? Reaching new hunting areas or trying to secure parts of the game board for your own clan are important factors for your strategy. Empty spaces are cheaper for your clan to settle in compared to spaces, where other clans already settled earlier. 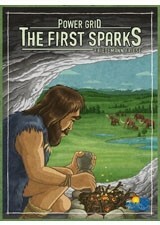 If you are the first to increase your clan size to 13 clan members you will win The First Sparks.